Oliver Gregory Pike was a pioneer in the field of wildlife photography, both in stills and moving pictures. He was a prolific author and lecturer. Above all, he loved nature. 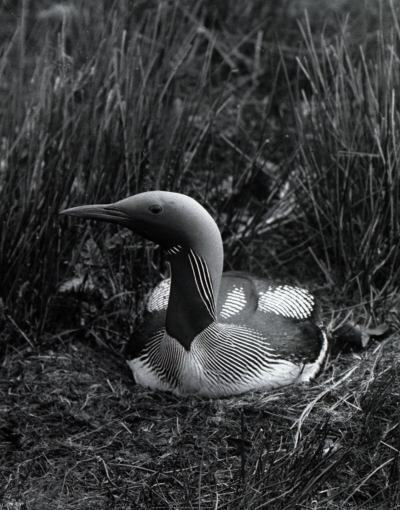 Oliver Pike obtained some wonderful photographs of rare birds before the First World War. This photo was taken in 1911 when he travelled to South Uist in the Outer Hebrides. He built a hide in the water and after nearly a week obtained several shots of a female black-throated diver on her nest. He exhibited a similar print at the Royal Photographic Society in 1912. On 16th November 2014, a "Blue Plaque" was unveiled on the house in Winchmore Hill where Oliver Pike lived when he was a boy and young man.